Launched on July 28, 1945, at Elco (Electric Boat Company) Naval Division in Bayonne, New Jersey, PT Boat 617 was assigned to Patrol Torpedo Squadron 42 and placed in service on September 21, 1945. Of the three manufacturers of this versatile and highly maneuverable craft, Elco produced the largest number for the U.S. Navy. PT (Patrol, Torpedo) boats were small, fast, and expendable vessels for short range oceanic scouting, armed with torpedoes and machine guns for cutting enemy supply lines and harassing enemy forces. Forty-three PT squadrons, each with 12 boats, suffered an extremely high loss rate in the war. Squadron 42, however, was the only squadron commissioned after the cessation of hostilities. Early in the war, the U.S. Navy standardized the design and construction of the PT Boat. Two basic and distinctly different types of PT Boats were built for combat—the predominant PT, the 80-foot long "Elco" boat, like PT Boat 617, and the 78-foot long "Higgins" boat, like PT Boat 796. The wooden PT Boat 617 measures 80 feet in length with a 21-foot beam and displaces 54 tons. After participating in the Victory Loan Bond Drive in October and November 1945, PT Boat 617 was decommissioned on January 28, 1946. It was sold into private hands on October 23, 1947, and used as a yacht, as a salvage vessel and as a diving platform in Florida. 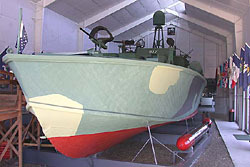 PT Boats, Inc., a nonprofit organization of World War II PT Boat veterans, bought the boat in 1979 and began restoration work. 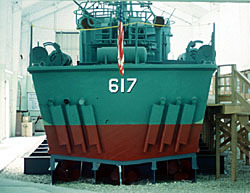 On September 1, 1985, PT Boat 617 went on display at Battleship Cove in Fall River, Massachusetts, which is the world's largest collection of historic naval ships, along with PT Boat 796. PT Boat 617 and PT Boat 796 are the world's only restored pair of PT Boats today. PT Boat 617, a National Historic Landmark, is located at Battleship Cove as part of the museum's historic vessel collection. Battleship Cove is located at 5 Water St. in Fall River, and is open to the public throughout the year for a fee. The times change slightly from season to season, and Battleship Cove is closed on Thanksgiving Day, Christmas Day and New Year's Day. For up-to-date information, please call 508-678-1100 or visit Battleship Cove's website.